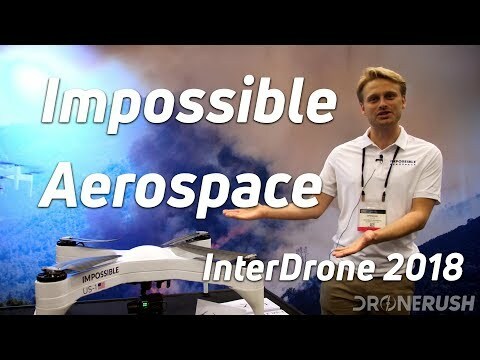 We are at InterDrone 2018 checking out some cool new drones, including the Impossible Aerospace US-1. Let’s dive in and see what the Impossible Aerospace US-1 has to offer. What is the Impossible Aerospace US-1? The US-1 is the first drone released by Impossible Aerospace and packs some great features. Unlike many other drones, the Impossible Aerospace US-1 has been engineered from the ground up to get an outstanding flight time. The Impossible Aerospace US-1 is a battery powered multi-rotor with a flight time of up to two hours. They former Tesla and SpaceX engineers on staff, and are using Tesla battery technology. The Impossible Aerospace US-1 comes in at a weight of 15.7 pounds and payloads of up-to 2.9 pounds. The intended payload for the Impossible Aerospace US-1 is the FLIR Duo Pro R thermal camera, along with other FLIR cameras available on request. The Impossible Aerospace US-1 has a range of up to forty-six miles, blowing many other drones out of the water. A top speed of 42 mph allows the Impossible Aerospace US-1 to complete missions in a reasonable time frame. How is the Impossible Aerospace US-1 controlled? The first way to control the Impossible Aerospace US-1 is to use the controller included in the box. The controller has sixteen channels, backlit LCD display, real-time flight data display, and a teacher-student link. For the drone racers and RC airplane hobbyists, we did not confirm that that is a Taranis transmitter, but we agree it sure looks like it. The Impossible Aerospace US-1 also has a ground station which is included with the purchase of a thermal camera. The ground station has an HD screen to show both the thermal and optical view from the drone, and a touchscreen to plan missions. The ground station has a full HD 60fps encrypted video link and can run on its batteries for up to five hours. Would you be interested in a drone that has a flight time of up to two hours? Share your thoughts in the comments below or head over to our social media accounts.